"I want to see our country united. 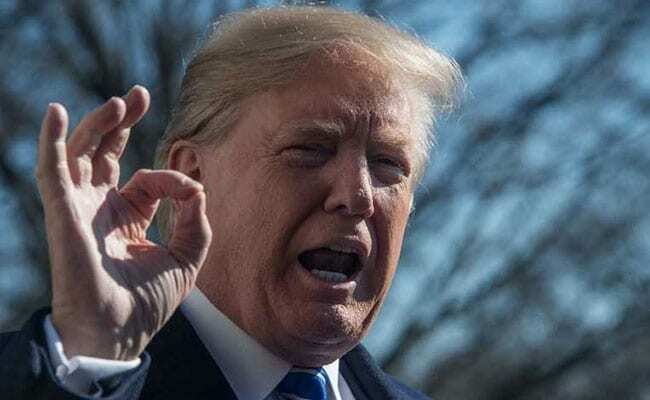 I want to bring our country back from a tremendous divisiveness," Trump told a group of television journalists Tuesday at the White House, according to PBS' Yamiche Alcindor. Trump said he would use part of the speech to call for a bipartisan deal on immigration. President Donald Trump will give his first State of the Union address at 9 p.m. Eastern time, talking up the U.S. economy and calling for bipartisanship - after a year in office during which his aggressive, mercurial politics often overshadowed the former and undermined the latter. "For the last year we have sought to restore the bonds of trust between our citizens and their government," Trump plans to say, in a speech excerpt released by the White House on Tuesday evening. In another excerpt, Trump will say "This is our New American Moment. There has never been a better time to start living the American dream. Trump also intends to use the speech to call for a bipartisan deal on immigration. On Thursday he proposed a deal that would allow "dreamers" - young immigrants brought to the United States illegally as children - to be given a path to citizenship, in exchange for an increase in border-security funding and large cuts to legal immigration. "So tonight I am extending an open hand to work with members of both parties, Democrats and Republicans, to protect our citizens, of every background, color, and creed," Trump will say, according to the excerpts. That tone will be markedly different from the one that Trump used in a Twitter messages earlier last week, in which he taunted the Senate's top Democrat, Charles Schumer, N.Y., for not agreeing to a bipartisan immigration deal. That tweet came after a short-lived government shutdown, which ended when Democrats backed down. "Cryin' Chuck Schumer fully understands, especially after his humiliating defeat, that if there is no Wall, there is no DACA," Trump wrote. "DACA" is an acronym for Deferred Action for Childhood Arrivals, an Obama-era program that allowed some "Dreamers" to avoid deportation. And Trump's call for bipartisanship and an end to division seemed unlikely to change the tone in Washington - where, in the hours leading up to Trump's address, lawmakers seemed more divided than ever. One major cause was the fight over a House Intelligence Committee "memo" that purportedly raises questions about federal investigations into Russian interference in the 2016 presidential election. Many Republicans have used that memo, which was written by staff members of the committee chairman, Rep. Devin Nunes, R-Calif., as a reason to question the validity of scrutiny of Trump and his staff by Special Counsel Robert Mueller. The divisions over immigration will be visible in the gallery that overlooks the House chamber. More than 50 Democratic lawmakers have invited "dreamers" to attend as guests to dramatize their demand for legal status. In response, Republican Rep. Paul Gosar, Ariz., tweeted that he had asked the Capitol Police to check all guests' IDs, and arrest "any illegal aliens in attendance." In Trump's box, he has guests who will highlight the threat posed by MS-13, a criminal gang active in both the United States and Central America. Trump's guests will include a federal immigration agent who has investigated the gang, and two sets of parents whose children were killed by MS-13 members. The excerpts released from Trump's speech show he will also push for increased spending on infrastructure - and reductions in the environmental review process for some new projects. "We built the Empire State Building in just one year - isn't it a disgrace that it can now take ten years just to get a permit approved for a simple road?" Trump plans to say. The excerpts show that Trump will also tout his administration's cutbacks on government regulations more generally. "In our drive to make Washington accountable, we have eliminated more regulations in our first year than any administration in history," he will say, according to the White House. Trump will walk into the House chamber on Tuesday with an approval rating around 39 percent. That's the lowest of any recent president at this point in his first term, going back to Harry S. Truman, according to the poll-aggregation site fivethirtyeight.com. The divisions have changed even one of the most durable Washington traditions: the president's triumphant walk down the House's center aisle, shaking hands with lawmakers from both sides. Some Democrats who had traditionally staked out seats along the aisle have said this year that they won't do it. In the audience, some female Democrats have said they will be wearing black as a signal of their support for the #MeToo movement, raising awareness to combat sexual misconduct. A number of Republican women have said they will wear red, white and blue to show support for the U.S. military. Trump faces a difficult political task: to reverse his approval numbers and refocus the public on the massive tax cuts pushed through by the GOP late last year. He speaks at a time when Democrats feel increasingly confident - having won a series of special elections in Trump's heartland, including a U.S. Senate seat from Alabama. But that task will require more than simply reading a speech Tuesday. It will require Trump to focus on the GOP's message and avoid distracting or damaging battles with the targets he's favored so far: celebrities, federal law-enforcement officials and his own Cabinet members. Last year, he couldn't do it. About a year ago, Trump gave his first address to a joint session of Congress - technically, not a "State of the Union" address - which was widely praised as his most "presidential" moment in office. A few days later, Trump accused former President Barack Obama of having Trump's "wires tapped" in Trump Tower during the 2016 campaign. He gave no evidence, and the FBI director later said there was "no information" to support Trump's accusation. This year, a CNN report indicates that Trump may already be planning a move that would distract from his State of the Union message - authorizing the release of the GOP memo that casts aspersions on the FBI's investigation of Trump.